Happy Thanksgiving! Now if you were to ask what Thanksgiving songs you can play on guitar, “Over the River and Through the Wood” is the one most people think about. But let’s not forget about the other Thanksgiving classic…”Thanksgiving Song” by Adam Sandler. Adam Sandler Thanksgiving Song made it’s debut on Saturday Night Live in the early 1990’s, and in this video guitar lesson I’m going to show you the chords and strums he used. For more on playing chords and learning about different strumming patterns, be sure and check out my Rhythm Guitar Mastery Course. You can download the guitar tablature for the entire song lower on this page. Here is another version of Thanksgiving Song. This version does have a lyric or two that could offend some…so don’t listen to this with your young kids in ear shot. This whole song has only 5 chords. Gmaj7, Am7, Bm7, Cmaj7 and D9. Below are the chord charts for the chords used in this song. 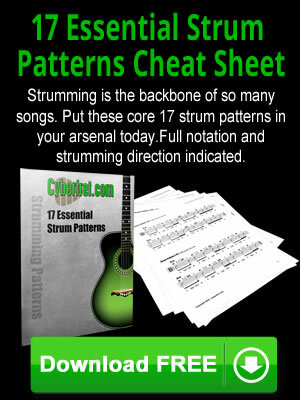 See the video guitar lesson above for more info on how to play them. There are actually 2 slightly different sets of lyrics for this song. The original Saturday Night Live version, and the live concert version. The versions from above. Below is a link to a music lyric site where you can get the lyrics for the live version. Right Click on the link below to save the file to your computer or other electronic gizmo.